As you can tell by reading about my sourdough bread and pizza crusts, I do a lot of sourdough baking. Frequent baking keeps my starters active, but I still have times when the starters must be fed to reactivate them or when I need to feed the starters but am not ready to bake bread. There are a few things I do with the discarded starter to keep it from going to waste. I do admit to times when I simply have to dump the spent starter down the drain. Of course it is better to put that material to good use. 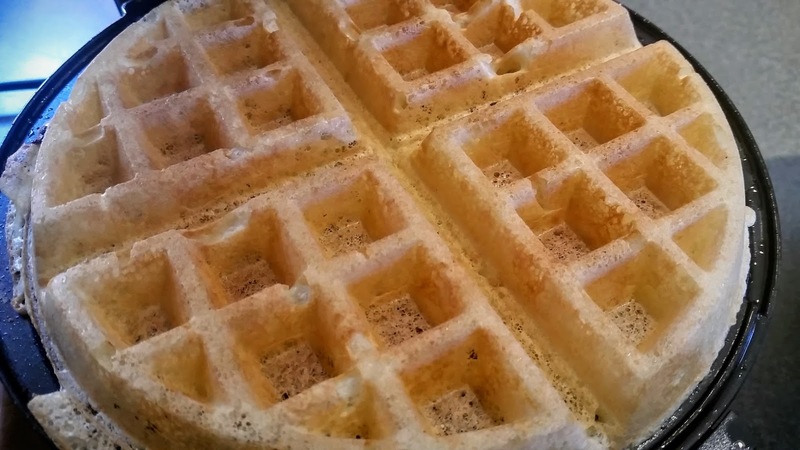 My most frequent use for tired sourdough starter is waffles. Sourdough waffles are deliciously tangy and light as air. I have limited myself to keeping just two sourdough cultures for the past 20 years or so. There was a time when I managed several more, but it was a lot of feeding and I kept finding myself going back to the two most reliable performers. I obtained them from Sourdoughs International on line. One is wild collected in the area of Naples, Italy. The other is from a bakery in Ischia. Each has its own character. Sometimes I use them together, and other times I combine them. For waffles, I use them both. I keep my sourdoughs in one-liter snap-top jars (some folks call them Fido jars) on the kitchen counter. I set the jars in bowl in case they overflow. It’s a much easier clean up to wash a bowl than it is to get sticky sourdough starter cleaned up when it decides to go crazy. In each jar, I maintain the culture with one cup of flour (I use Tipo 00, but any all-purpose flour is fine, King Arthur all-purpose would be my second best choice) and one cup of water. This is 100% hydration. I may vary the hydration of the starter for different projects, but 100% is the norm. When the culture is very active, it foams to the top of the jar, and may squeeze out around the lid gasket (thus the bowl under the jar!). When it is inactive, it has some small bubbles in the flour/water mix, and it may even have some yellow-ish liquid on top. That liquid is called “hooch.” Hooch is no problem; it just means the culture needs to be fed. If the starter is particularly tired, then it may need several sequential feedings to revive. When the starter is in this condition it means that the lactic acid bacteria have overtaken the yeast; sequential feedings give the advantage back to yeast and restore the desired conditions needed for use in making bread. These are the times when waffles are in order. OK, waffles could be in order at any time, but this is the time when you can put that otherwise wasted sourdough to great use. (I have another Spring-time dish where I make sourdough dumplings with chicken, braised endive and wild mushrooms, but that is a story to come…) “Does anyone want waffles?” I ask, knowing the answer. Yes, of course everyone wants waffles. Unlike most of the recipes you may find, this one does not require advance planning to start the night before. It can easily be made on the spur of the moment. I have three waffle irons. Don’t ask. I pick one and plug it in to preheat. Today, it’s the Belgian-style model. I like this one because of the deep wells and because it flips over to add one more bit of lightness to the waffles. I am after waffles that are tasty, crisp, and extremely light. Not a dense, doughy toaster waffle. Dump the contents of the two sourdough starters into a bowl. This is about 2 cups of flour and 2 cups of water. Exact measurements are not essential. Add one cup of flour and one cup of water back into each jar, stir each with a clean spoon (avoiding cross-contamination of the cultures to preserve their unique identity), and place the jars back in their bowl on the counter. Think about making bread later when they perk up. To the bowl containing the prior contents of the two jars, add about ½ cup flour and ½ cup water. Add to it: 2T sugar, 1t salt, 1/2t baking powder, 5T oil (I use grapeseed oil, but any neutral oil will work…you may also use butter or bacon fat if you prefer a different flavor. I am going for a clean sourdough flavor), and 3 egg yolks. Mix thoroughly. Put the 3 egg whites in a separate bowl and whisk until firm peaks form. Fold the egg whites into the batter. Mix 1/2 t Baking Soda into 1T water. Fold this into the batter. Be careful not to over mix at this point. 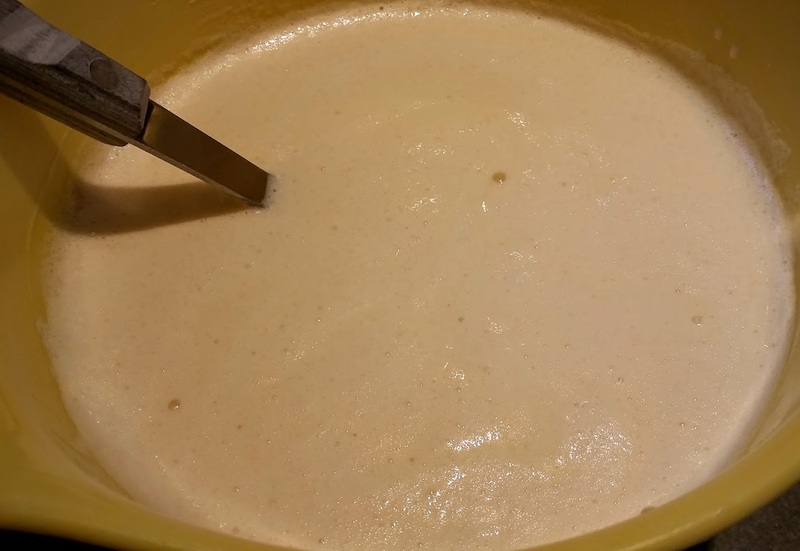 Ladle batter into the hot waffle iron. There is usually no need to oil the iron. The batter should just barely come to the top of the raised parts in the iron. Make sure it is evenly spread. The first few waffles, I start with less than needed to make a whole waffle so I can gradually increase on subsequent waffles and avoid messy overflows. The Belgian-style waffle iron I have (Waring) flips over once you close the lid. This lets the uncooked batter flow into the other side of the waffle, making it even more airy than it would otherwise be. 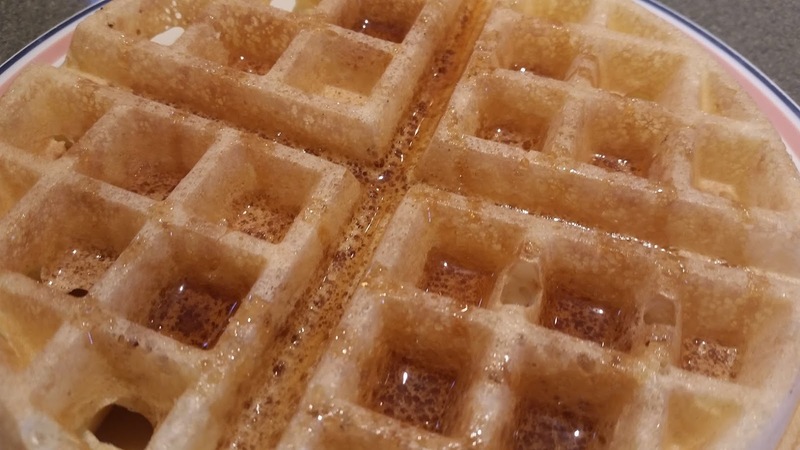 Don’t worry if your waffle iron does not do this because these waffles are light. I set the waffle iron to its max setting to keep it hot and make sure the waffles are very crisp on the outside and delicate on the inside. This makes about 12 waffles. Count on 2-3 per person. Serve the waffles to each person right from the iron. Top with whatever you like. I prefer maple syrup or macerated berries. Chicken and gravy is also good. They are pretty good on their own, too! If there are any leftovers, let them thoroughly cool on a rack and then store in the refrigerator. Reheat in the toaster. It won’t be as good as fresh, but it will still be tasty.